Famed space man Buzz Aldrin, the second person ever to walk on the moon, is celebrating his 83rd birthday today (Jan. 20) in cosmic style. Aldrin, who along with Apollo 11 astronaut Neil Armstrong boldly walked where no one had before in 1969, is marking his birthday on the road with a trip to England. "I'm heading home today if the UK weather allows," Aldrin wrote in a post on Twitter today, where he writes as @TheRealBuzz. This month, Aldrin helped launch the AXE Space Academy, a private spaceflight competition that aims to launch 22 people on suborbital spaceflights as part a deal with the space tourism company Space Expedition Curacao and XCOR Aerospace, which is building the Lynx space plane to be used on the flights. "Space travel for everyone is the next frontier in the human experience," Aldrin said during the project's launch this month. But Buzz Aldrin is likely most well-known for his role on NASA's Apollo 11 mission, which made the first manned moon landing on July 20, 1969, when and Armstrong landed on the moon and performed the first moonwalk. Aldrin served as lunar module pilot for the Apollo 11 mission, with Armstrong commanded the mission. Astronaut Michael Collins, meanwhile, served as command module pilot and remained in orbit around the moon during the landing. Armstrong died at age 82 last year. Aldrin's fist space mission, Gemini 12, launched on Nov. 11, 1966, sending him and astronaut James Lovell on a four-day mission to test spacewalk methods, among other goals. It was the final mission of NASA's Gemini program, allowing the space agency to proceed with the Apollo missions that ultimately sent Aldrin to the moon. Aldrin, Armstrong and Collins launched their Apollo 11 mission on July 16, 1969. Aldrin and Armstrong spent two hours and 15 minutes walking on the lunar surface during their time on the moon. The Apollo 11 crew returned to Earth on July 24, 1969. Five more successful moon landing missions would follow. Aldrin left NASA in 1971 and retired from the Air Force a year later. Altogether, he logged 289 hours and 53 minutes in space. 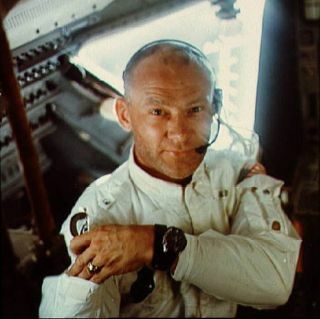 Since then, Aldrin has used his moonwalker fame to lobby for continued space exploration, specifically a return to the moon and missions to Mars. He has written several books, including two autobiographies, and made several notable television appearances, with stints on "Dancing with the Stars," "Top Chef," "The Colbert Report" and "Big Bang Theory." Earlier this year, Aldrin settled his divorce from his wife Lois Driggs Cannon after 23 years of marriage, citing "irreconcilable differences."